A New Option in Athletic Mouthwear: Scientifically proven to enhance concentration, increase strength and speed, UnderArmour™ Performance Mouthwear can help you improve in your favorite sport—from baseball to golf to hockey. Because these custom-created mouthpieces prevent you from clenching your teeth during training or competition, your body doesn’t trigger your brain to release performance-hindering hormones that can lead to decreased performance due to stress, tiredness, or simple distraction. 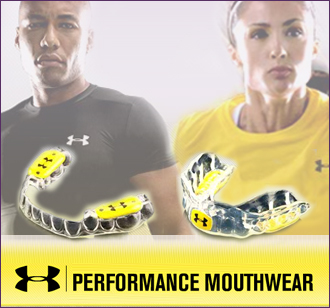 For athletes who want to protect their teeth and enhance their performance, UnderArmour Performance Mouthwear provides performance gear suitable for athletes of all sports. Different from traditional mouthguards that only provide protection, Performance Mouthwear included patented Bite Tech technology that relieves pressure on the temporomandibular joint and prevents teeth clenching. Because it prevents the hormone release associated with clenching the teeth or the jaw, you’re able to reach your full potential without stress hormones slowing you down. Recommended by dentists, trainers and coaches, and used by hundreds of professional athletes, Performance Mouthwear’s performance-enhancing qualities have been studied and reported on in respected peer-review journals.